1. Place the cashews in a bowl, cover with water and allow to soak for several hours or over night. (Alternatively, you can cover with water, heat to a simmer and turn off the heat and allow to soak for at least an hour.). 3. Place cashews in a food processor or high speed blender with the lemon juice, salt and about half the liquid. Pulse to process scraping the sides down as necessary. Add the remaining liquid and process for several minutes until extremely smooth. 6. Combine the salsa verde and cashew sour cream in a medium bowl. Season with salt and pepper to taste. 7. Mix the shredded chicken with approximately 1 1/2 cups of the salsa/sour cream mixture. 8. Roll 1/8th of the chicken mixture in each of the tortillas (about 1/3 - 1/2 cup each) and assemble the chicken enchiladas, side by side, in a pan (use 9x13 or similar size/shape). 9. Top the chicken enchiladas, with the remaining salsa/sour cream mixture. (Thin out the sauce with extra chicken stock if it is too thick after heating). 10. 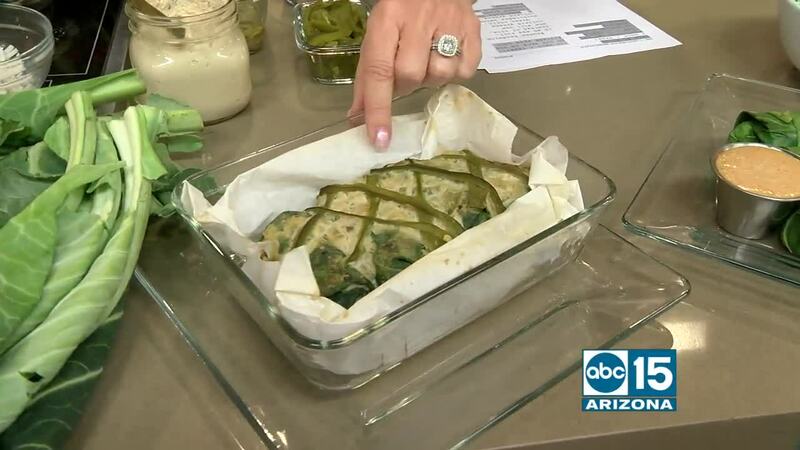 Cover with aluminum foil and heat in the oven for 30 minutes or until heated through. 11. Remove from the oven and top with slices of avocado and scallions. Serve immediately. 1. In a medium bowl, mix together creamy cashew cheese, shredded nut cheese, Russian dressing, and horseradish. Fold in corned beef, sauerkraut, and chives. 2. 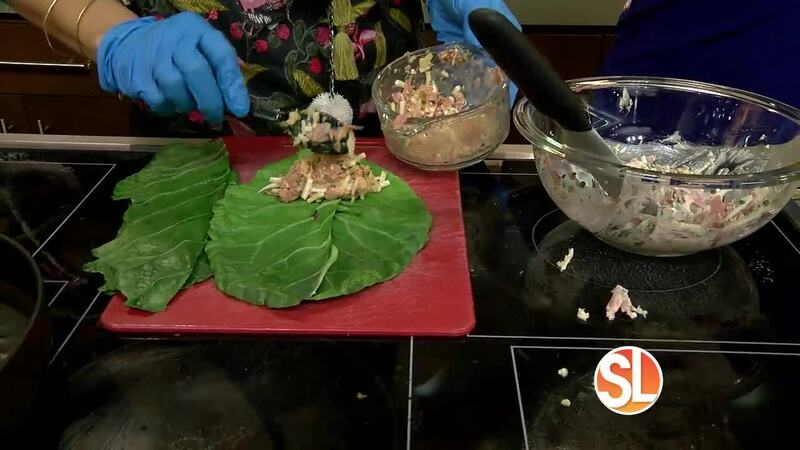 Set a collard green leaf in front of you and spoon 2 tablespoons (max) reuben mixture in the bottom 1/4th. Fold up bottom half and sides, then gently roll. Repeat with remaining filling and leaves. 3. In a large deep-sided skillet over medium heat, heat 1 inch oil until it starts to smoke a little, then, working in batches, add egg rolls and fry until slightly browned, 1 minute per side. Drain on a paper towel-lined plate and let cool slightly. Repeat with remaining egg rolls. 4. Serve warm, with Russian dressing for dipping. Note: You can also skip the frying and bake for 30 minutes in a pre-heated oven at 350. Or heat up mixture and wrap in a raw collard green and enjoy.